New York City radio personality Charlamagne Tha God, of Power 105.1’s The Breakfast Club, is known for never biting his lip, no matter what the consequences are. Well, as he revealed on-air on the same morning he was jumped outside Power 105’s building. The incident happened in Tribeca as Charlamagne was headed to work. Charlamagne gave his first interview discussing the incident [outside of The Breakfast Club] to Jack Thriller and Thisis50. Charlamagne initially claimed he was jumped by five unidentified men, including one camera man who distracted him by asking him for a “drop” and started filming. He later changed the number to 3, not including the camera man. 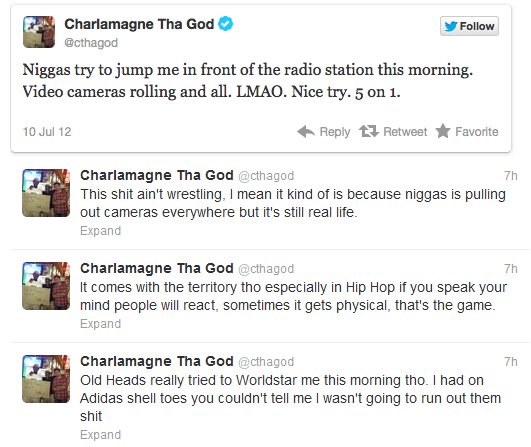 Charlamagne tweeted about the incident and later while on the air at Power 105.1 Charlamagne predicted that the footage would be posted on Worldstar later on that day. He also hinted at who he thought was behind it by saying that the timing was bad in light of the current situation. Charlamagne was referring to the latest personal attack that he had released on rival radio personality Funkmaster Flex in which he referenced several personal domestic issues that painted Flex in a bad light. Eventually the footage did get posted and here it is. After being asked for a “drop” or interview Charlamagne responds by asking: “What’s up with y’all and these drops man?” At which point a man then approaches him from behind punches him in the head. Charlamagne takes off running and nearly gets hit by a car. This entry was posted in www.sub-z.info and tagged beef, Charlamagne, Charlamagne Tha God, Power 105.1, sucker punched. Bookmark the permalink.